The traditional barn gets a brilliant reinterpretation in the modern charred wood-clad Sleeve House. 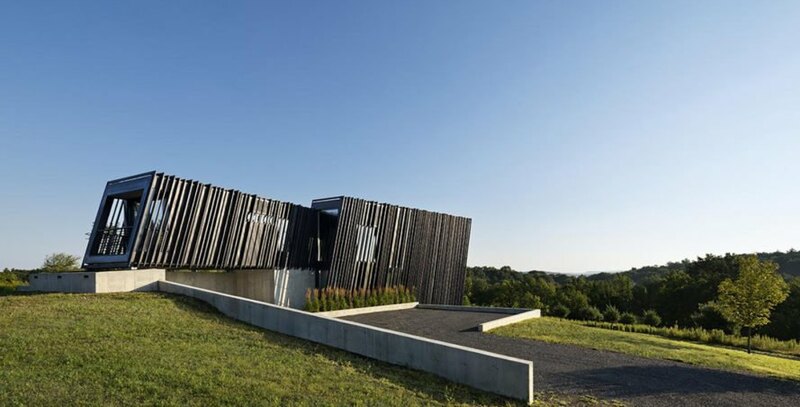 Two elongated volumes – a smaller one sleeved into a larger – comprise this timber house located on an open rolling hillside in New York state. Architecture firm actual / office used Shou Sugi Ban to give the home a sustainable, low-maintenance exterior that complements the surrounding landscape. The Sleeve House sits on a sloping terrain around two hours north of New York City in a rural area of the Hudson Valley. Its two volumes–one sleeved into the other– create three different types of spaces both on the inside and the outside of the house. The space between the inner and outdoor volumes accommodates common areas, including an entry gallery, a narrow vertical slot for the stairs, and a spacious living space with a sloping glass wall. Walking into the smaller volume from the main one creates an experience of entering a different universe. The smaller volume contains private areas and a study. These spaces feature warm, soft finishes which contrast the rough materials–exposed concrete and charred wood– that dominate the rest of the interior as well as the exterior. The house is clad in Shou Sugi Ban (charred wood) that makes the house stand out while complementing its surroundings and gives it depth, pattern and texture. Large glass surfaces offer expansive views of the landscape. Two elongated volumes – a smaller one sleeved into a larger – comprise this timber house located on an open rolling hillside in New York state. 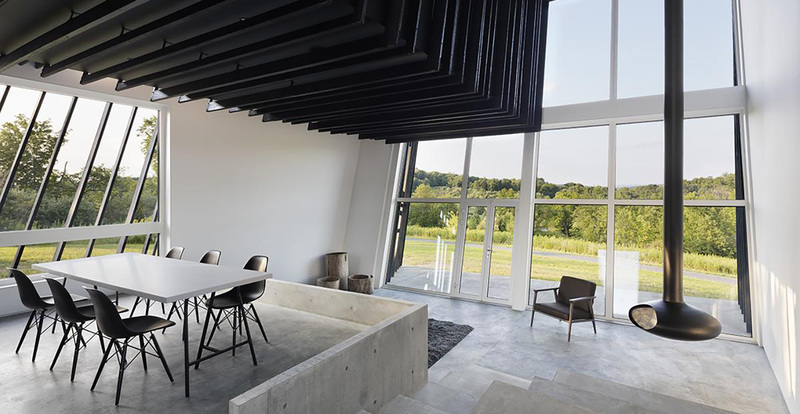 Architecture firm actual / office designed the building as a modern reinterpretation of traditional barns and other farm building in the area. The Sleeve House sits on a sloping terrain around two hours north of New York City in a rural area of the Hudson Valley. Its two volumes–one sleeved into the other– create three different types of spaces both on the inside and the outside of the house. 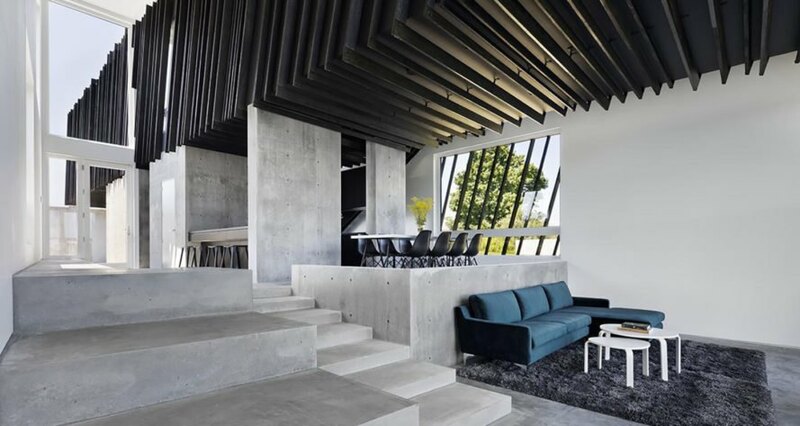 The space between the inner and outdoor volumes accommodates common areas, including an entry gallery, a narrow vertical slot for the stairs, and a high ceilinged living space with a sloping wall of glass. Walking into the smaller volume from the main one creates an experience of entering a different universe. The smaller volume contains private areas and a study. These spaces feature warm, soft finishes which contrast the rough materials–exposed concrete and charred wood– that dominate the rest of the interior as well as the exterior. The house is clad in Shou Sugi Ban (blackened wood) that makes the house stand out from its surroundings and gives it depth, pattern and texture. Large glass surfaces offer expansive views of the landscape.